During the past 7-days, frequent frontal activity helped to ensure heavy rainfall (2 inches or greater) over portions of the Midwest, the Middle and Lower Mississippi Valley, the southern Plains, the Ohio and Tennessee Valleys, the Northeast and mid-Atlantic, and the Pacific Northwest. The Southern Atlantic Coast region also received areas of heavy rainfall due to the slow passage and subsequent meandering of Tropical Storm Julia. Drought remains entrenched over the southern Appalachians vicinity, parts of the Northeast/eastern Great Lakes region, the northern Plains, and much of the West. View drought monitor here. Across the general vicinity of the southern Appalachians, drought can be traced back at least 6 months. Therefore, a drought impact line was drawn across this region to not only encompass short-term impacts, but to include long-term impacts as well. Starting in northeastern Tennessee and adjacent parts of southwestern Virginia, rapid drying has contributed to a substantial number of trees losing their leaves prematurely. The D0 areas in northeastern Tennessee and western North Carolina were connected on the depiction to account for the spreading dryness. Based on the ACIS (Applied Climate Information System) 30-day SPI (Standardized Precipitation Index), CPC’s soil moisture percentiles, and VegDRI, D1 was expanded slightly east to include Hamblen County (Morristown, TN area). In North Carolina, the North Carolina Drought Group recommended a significant expansion of D1 in western North Carolina. These changes were based on a number of considerations, some of which include low stream flows, Percent of Normal Precipitation (PNP) at various time-scales, and agricultural reports indicating damaged crop and pasture conditions. A substantial number of trees are prematurely losing their leaves and yellowing way ahead of schedule. Above-normal temperatures (anomalies of +4 to +5 degrees F in maximum temperatures) during the past week) also added to the extra evapotranspiration (ET) demand. Incidentally, the Asheville airport only received 0.02-inch of rain during the first 3 weeks of September. With the remnants of post-Tropical Cyclone Julia still meandering around the region, the depiction in east-central North Carolina remains unchanged, pending reassessment of conditions next week. In central and northwestern Georgia, a number of 1-category degradations were made to the depiction. 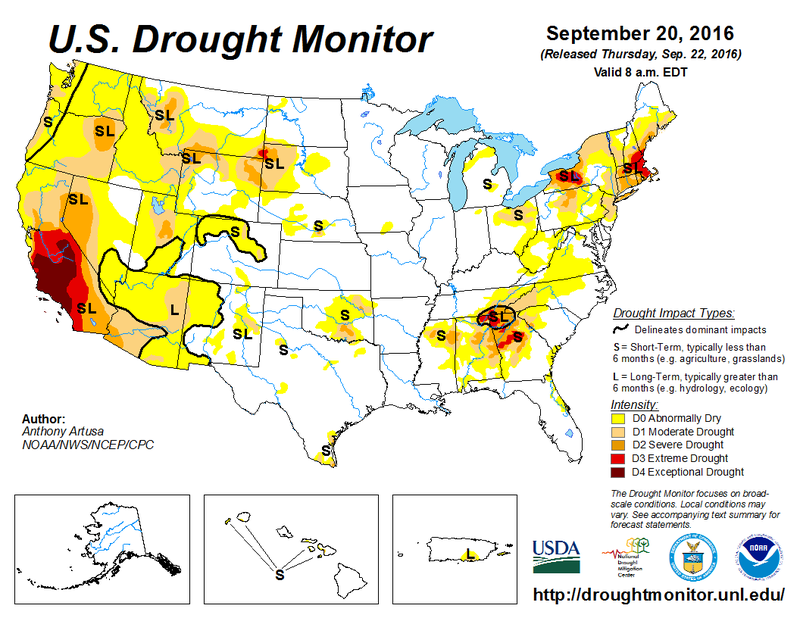 Extreme drought (D3) was expanded slightly north and east into the Chattanooga, TN area. Since March 1st, Chattanooga received 13.80 inches of precipitation, which is less than half of what it normally receives during this same period. The last time this happened was over a century ago, in 1902. In northwestern Georgia, very dry conditions have contributed to grassland and woodland fires. This area has been hard hit with withered crops, low-flow creeks, cattle sell-offs, and farmers seeking hay from neighboring states to feed livestock. There have also been reports of armyworm infestations. After winter rains tapered off in March, prolonged heat began in May, along with a corresponding high ET demand. Many area streams were reduced to a trickle. There has also been a large impact on hay, soybeans, and corn. In extreme northeastern Georgia, D2 was expanded eastward across the counties of Union, Towns, Lumpkin, and White. In Alabama, showers fell generally south of a line from Marion (northwest part of state) to Geneva (southeast part of state). For areas north of this line, lots of small-scale degradations (along with a few improvements) were required. Seasonal pasture yields were dismal in some areas, notably central Lauderdale County and St. Clair County. In northeast Mississippi, the two D0 areas were connected, indicative of spreading dryness. Moderate to heavy precipitation (0.5-4.0 inches) fell across portions of northeastern Indiana, northwestern Ohio, and south-central Kentucky. This prompted the removal of abnormal dryness (D0) in these areas. However, abnormal dryness (D0) was expanded across southeastern Ohio and western West Virginia, which has experienced persistent dryness during the past 30-days. Soils are very dry across this area. In south-central Iowa, a slight expansion of D0 was rendered to the depiction, based on 60-day Departure from Normal Precipitation (DNP). In western Montana, moderate precipitation (0.5-2.2 inches) led to small improvements in the drought depiction, including the reduction and/or removal of D2 in Granite, Ravalli, and Missoula Counties. However, increasing dryness across the rest of the state prompted the expansion of D0, D1, and D2 categories across most of the southern half of the state. Groundwater levels along the Rocky Mountain Front (especially Teton County) are a concern. In northeastern Oklahoma, persistent dryness, reduced pond levels, spotty rains which keep hitting (or missing) the same areas, dormant grass, 30-, 60-, and 90-day DNPs, CPC Soil Moisture, and the 30-day SPI warranted a modest increase in coverage of D0 and D1 in this part of the state. Recent precipitation in south-central Oklahoma resulted in the removal of a D1 patch. In Texas, localized adjustments were made to the map, though as a whole, the state remains in relatively good shape. Since this is the normally dry and warm time of the year when no real changes are expected to occur, there were no changes made on the map. Beneficial precipitation in recent weeks and cooler temperatures are helping to moderate ET demand, prompting some improvement of D1 in north-central Utah (Duchesne and Carbon Counties), and trimming of D2 in Carbon County. The 30-day SPI has improved to the 0 to +1 range in this area. An impact line was introduced in Colorado to emphasize the short-term nature of the drought there, while the “SL” impact label (emphasizing both short- and long-term impacts) still fits for much of the surrounding area. This was based to a large degree on the objective “worst case” drought blends. A stationary front draped across the mid-Atlantic and Northeast coasts on Monday brought heavy rainfall (2-4 inches) to the area. This resulted in widespread removal of abnormal dryness (D0) across southern New Jersey, most of the Delmarva Peninsula, and the Tidewater region of Southeast Virginia. East of the Potomac River, in Prince Georges County, MD, rainfall amounts between 1.0-2.5 inches warranted the removal of D0 in that area. Rainfall associated with frontal passages prompted a 1-category improvement across southern Cattaraugus County in southwestern New York state, which shows up on the Advanced Hydrologic Prediction System (AHPS) 7-day observed precipitation map as southwest to northeast-oriented swaths of heavier rain. In contrast, where precipitation amounts and stream flow levels have been low, D0 was expanded to include portions of northern and western Maryland, and south-central Pennsylvania. In the Lower Hudson Valley of southeastern New York, which missed out on recent rainfall, moderate drought (D1) was expanded across Dutchess and Putnam Counties. The Vegetation Drought Response Index (VegDRI) clearly shows the magnitude of the drought across southern New England, adjacent southeastern New York, and central Pennsylvania. Despite some portions of eastern New England receiving heavy rainfall in the past 3 or 4 days (some in a very short period of time), no changes were rendered to the area’s drought depiction. With the entrenched drought in place, it’s tempting to introduce short-term improvements to the depiction, but it is too early to tell what the integrated effects will be regarding parameters such as soil moisture (how much moisture actually soaks into the soil, as opposed to running off), stream flow rises/falls, etc..
U.S. Geological Survey (USGS) stream flow gauges indicate there has not yet been a response to the recent heavy rainfall in eastern Massachusetts, for example, with most gauges at or below the 10th percentile. No dryness or drought is currently indicated in Alaska. In Hawaii, beneficial (and in some cases, excessive) rainfall supported 1-category improvements this week for Molokai, Lanai, Kahoolawe, and western portions of Maui. In Puerto Rico, low stream flows are observed across much of the east-central part of the island. Moderate to heavy rain (0.5-3.0 inches) fell across the northern part of this area, with light rain (or no rain) over the southern part. Though no changes were made this week to the depiction, one area for possible expansion of D0 next week is to the east-northeast of where it currently is over the island. During the next 5 days (September 22-26), most dryness or drought areas east of the Mississippi River are not expected to receive significant rainfall. Beneficial rain is, however, forecast for some areas west of the Mississippi River, including the southern Plains (2-3 inches), and from the northern High Plains and northern Rockies southward across northern Utah (1.5 to locally as much as 6.0 inches). During the 6-10 day period, September 27-October 1, odds favor above-median precipitation across the south-central contiguous U.S., peninsular Florida, and the Upper Mississippi Valley/Dakotas region. Odds favor below-median precipitation for portions of the mid-Atlantic, Carolinas, northern Georgia, and eastern parts of Kentucky and Tennessee. Below-median precipitation is also favored for most areas west of the eastern slopes of the Rockies.